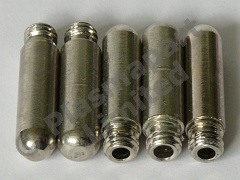 SG 55 or AG 60 electrodes suitable for use with the SG 55 torch, which is used on many Chinese plasma cutters. This type of consumable shares its electrodes and nozzles with the WSD 60P consumables, the only difference between them is the shroud, the WSD 60P consumables' shroud features a ring to allow the fitment of a standoff guide. The electrodes are chromium plated turned copper, with hafnium cores. This pack is supplied as shown, and contains 5 electrodes.